In 1936, the prophet and leader, Tahupotiki Wiremu Ratana met then Prime Minister Michael Joseph Savage at Parliament. He laid on the table four items. a potato, a gold watch, a pounamu heitiki and a huia feather. Ratana explained the potato was the ordinary Maori needing his land because "a potato cannot grow without soil". The watch was broken representing the broken machinery of Maori land law. The pounamu represented the spirit, the mana and the traditions of Maori and the huia feather was a sign of chieftainship, which Savage could wear if he were to take on the resolution of these issues so important to Maori. The imagery of the items, symbolising the state of Maoridom and its relationship with the Crown, is profound. His pursuit of justice for tangata whenua was never more apparent than in the delegations he took to London, calling for the entrenchment of Te Tiriti o Waitangi in law. This week, as thousands of morehu flock to Ratana Pa, it is a good time to take stock of how far we have come as a nation in honouring the legacy of this remarkable man of faith, a healer, a visionary, a leader of the people. The symbol of the Ratana church, te Tahu o te Maramatanga (a pin with a star and crescent moon), reminds us all of the visitation that inspired Ratana on a spiritual and political path of action 100 years ago in 1918. We look forward to catching up with all our whānau from Te Waipounamu who had the privilege this week of being at the Temple, to remember the legacy of Tahupotiki Wiremu Ratana, and all he represents. .
One of the special features of the week leading up to the commemoration of the birth of T.W Ratana on 25th January, is the way in which mokopuna, tamariki and rangatahi are honoured at the centre of the celebrations. There is nothing as exciting as seeing and hearing the mass Brass ensemble in their brightly coloured uniforms come on to the marae. As the band marches down the street, children tag along, swinging their arms in time, the adults laughing with the joy of all ages. Rangatahi have their time on the stage in the talent quest that occupies the attention into the dark of night; or next day on the sportsfield. Mana Rangatahi – AKA Apa Jedi – have been engaging in some awesome activities championed by Ngati Apa ki te Rā Tō in Blenheim this week. 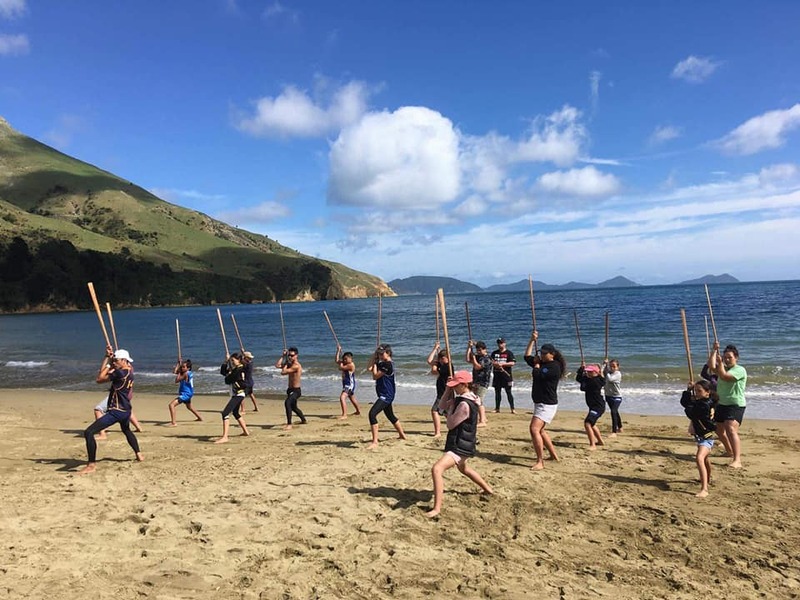 The wananga looked amazing – taiaha on the beach, wananga on the top of the hill, waiata, karakia, waka ama, whakawhanaungatanga doesn’t get any better than this! Ra Whānau ki a Eru! 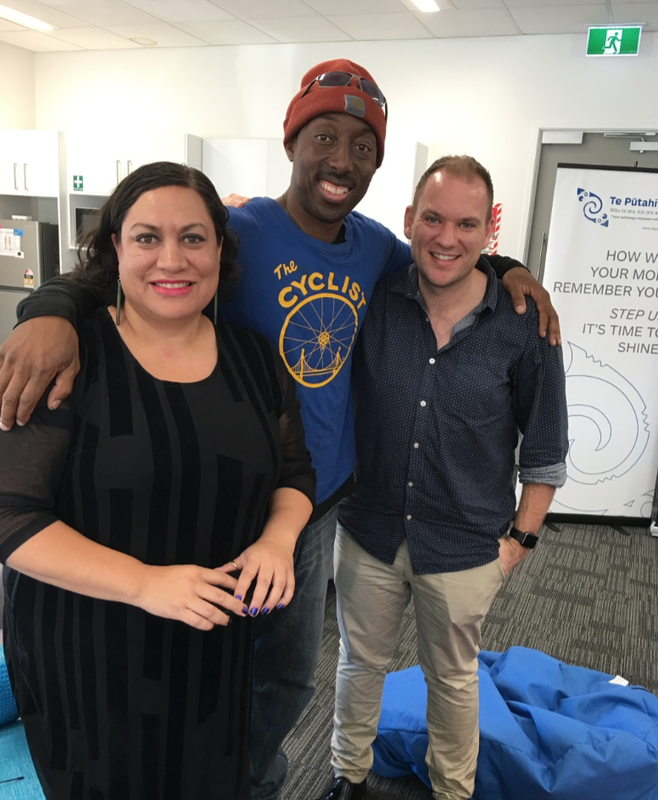 Speaking of rangatahi, one of the great gifts of working in a hub is the opportunity to share those magic milestone moments such as the 40th birthday of Dr Eruera Prendergast-Tarena! This week we had the pleasure of meeting Antwi Akom and his wife Yung-ai. Antwi is the founding director of a joint research center with the University of California San Francisco UCSF Medical School and San Francisco State University called the Social Innovation and Urban Opportunity Lab--we focus on building power and self-determination with vulnerable populations. Check out their website: http://soullab.co/. Antwi is interested in exploring the potential for whānau of a communications and social movement platform he has built called Streetwyze (Streetwyze.com). President Obama named Streetwyze as one of the top twelve most innovative data and communications platforms for vulnerable populations in its ability to unlock the power of community-driven data. He asked us questions like “where does a 15 year old Māori girl find peace and joy?” or “where are the places that a 65 year old Māori man could walk safely in this city at night?”. His challenge to us if we don’t know the answer to these questions, how can we believe we know what whānau want. While with us, it was a great opportunity to present Antwi and Yung-ai with one of the ipu whenua (placenta planting packs) from waka whenua. Waka Whenua is a wonderful initiative that Te Pūtahitanga o Te Waipounamu has supported in its gestation period. Our overseas guests were thrilled that they had such a beautiful taonga as they prepare for the birth of their baby in the coming weeks. Another one of the treasures of Te Tauihu – not far from Waka Whenua in Motueka – is Taonga by Timoti; a whānau company that will set up a workshop equipped with tools that will be used to carve sacred taonga collected from the awa. Once the workshop is established, carving sessions will be delivered to schools and other organisations that focus on building cultural confidence and practical knowledge in the art of carving. The first priority is to create the first version of Taonga Wānanga -to spend the day with whānau, to inspire and enlighten them on this ancient art form, so that they may carry it on through future generations. In a recent visit to the workshop, we are so excited by the progress that is being made. Ka mau te wehi! Te Pūtahitanga o Te Waipounamu is partnering with Rangitane o Wairau Ahi Kaa Incorporated to deliver Ngā Pakiaka Morehu o Te Whenua in Marlborough. The aim is to increase awareness amongst Ahi Kaa of their historical roles and responsibilities as kaitiaki. Ensuring an increase in cultural competency to achieve whanaungatanga within Rangitane whānau, hapu and iwi. Whānau will engage through a series of six storytelling wānanga that will be held on sites of significance that are integral parts of the Rangitane cultural identity. The wānanga will be a resource for future whānau learning of customary values and practices of Rangitane whānau. While written material will be made available to programme participants, the focus will be on developing competency of Ahi Kaa whānau to understand the physical and metaphysical world of their tupuna. 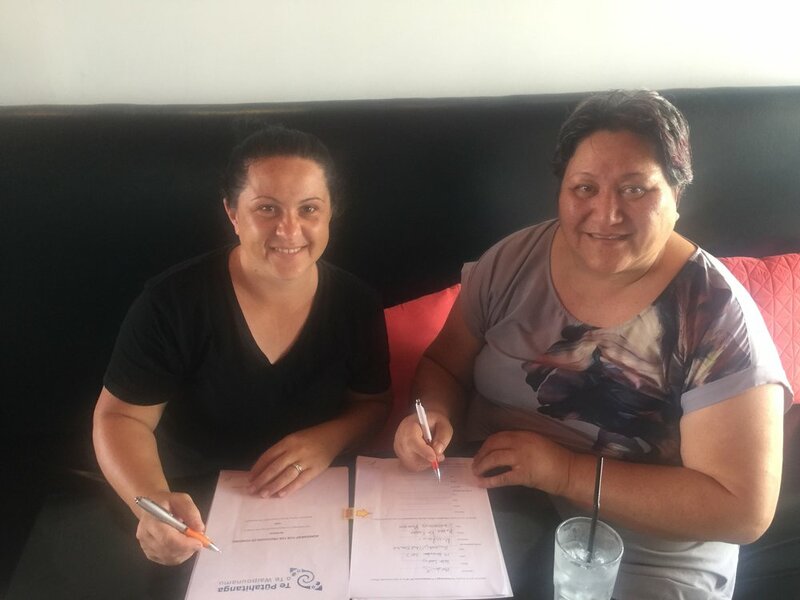 Milly Finlay and Sue Parish from Rangitane ki Wairau Ahi Kaa signing their Agreement. This week our hub had a morning team to say goodbye to one of our wonderful advisors, kaimahi, and friend from Te Puni Kokiri, Kim Wetini. 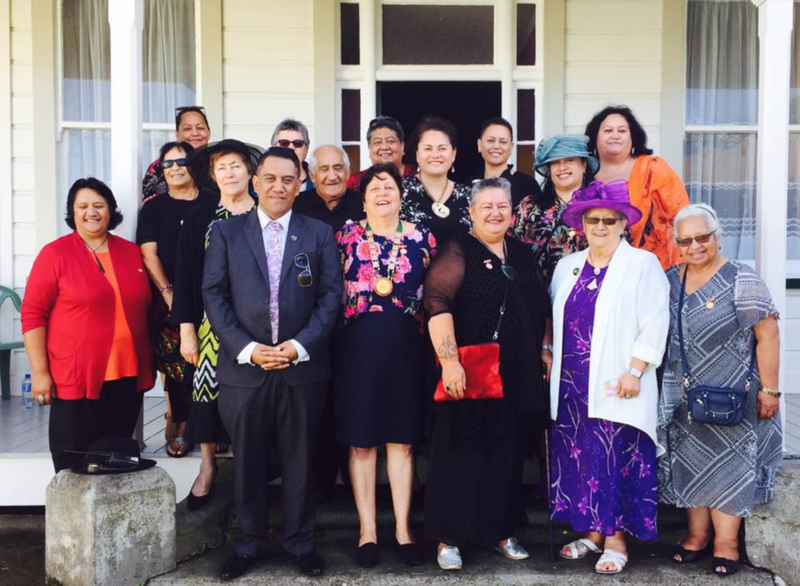 Kim who has been the Senior Advisor – Kaitohu Tōmua with Te Puni Kokiri, is leaving Te Waipounamu for a new life in Rotorua. Kimi has made a significant contribution across so many spheres of community life, but in particular following the earthquake recovery and response endeavours of the last decade. We wish her well in the land of Te Arawa! We are delighted to welcome our new Outcomes Specialist, Sue Quinn. Sue brings a wealth of experience to our team in the field of outcome reporting. Sue has been the Business Development Manager for Presbyterian Support Upper South from 2010. In the context of her role, she designed the national framework for Family Works NZ RBA outcomes reporting and supported the implementation of this in seven regions. This involved developing national tools, data collection and reporting systems for their performance measures. 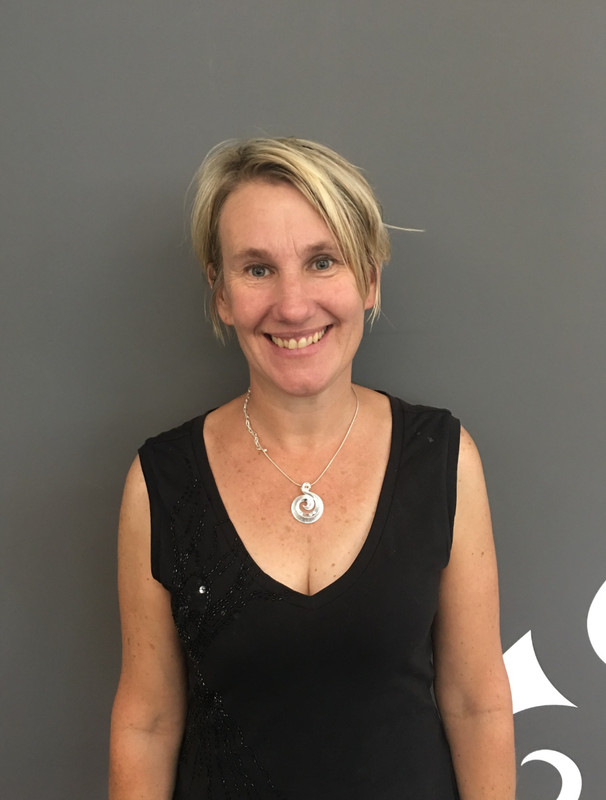 Sue is excited to have the opportunity to contribute to the Whānau Ora commissioning kaupapa and we are excited to be able to add her depth of knowledge and skills to our multi-talented team. The Minister of Conservation is responsible for appointing members to Conservation Boards across Aotearoa and is seeking nominations for membership. Preference will be given to people residing within the area of the Board for which they are nominated. Appointments will take effect from 1 July 2018, and will be for a term of up to three years. Chatham Islands (3), Nelson/Marlborough (3), West Coast Tai Poutini (2), Canterbury Aoraki (2), Otago (5), and Southland (3). Additional information and nomination forms may be obtained at www.conservationboards.org.nz or from any Department of Conservation Office or from Rick McGovern-Wilson email mcgovern@doc.govt.nz or phone 027 200 5716. Nomination forms are to be sent to the Minister of Conservation c/o the address on the nomination form. Closing date for nominations is 5pm on Friday, 2 February 2018. 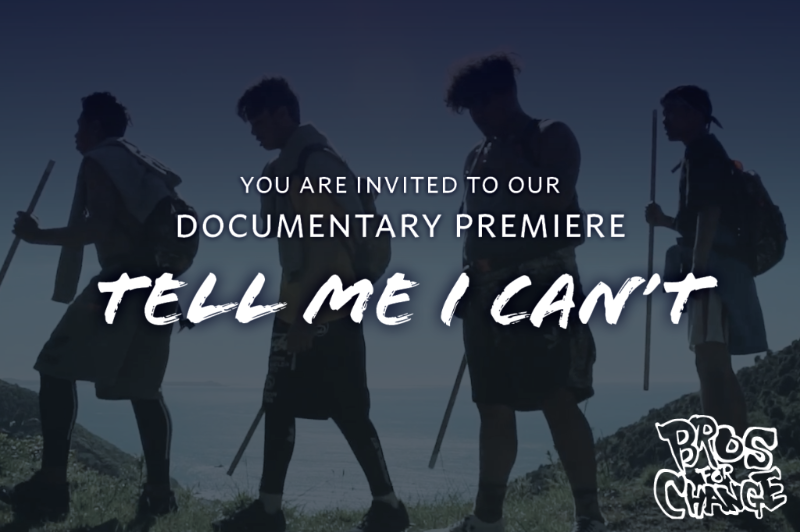 As we go to print this week, there is a buzz in the air as we all get ready to attend the opening premiere of a documentary about the rangatahi from Haeata Community Campus who have completed the Bros for Change timatanga hou programme. The documentary records the magic of Bros for Change, why it started, the staff and some challenges and successes. We say well done to Jaye Pukepuke and the wider team for all you have done to make this moment happen.